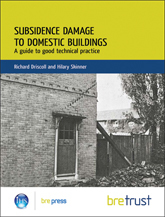 A review of the information available on the many components of the problem - highlighting advice when dealing with subsidence, and providing "best practice" in the design of new buildings where subsidence could be a problem. The publication provides a comprehensive examination of subsidence damage to domestic buildings. Annex B Blank damage report form used for BRE's subsidence database. "Subsidence damage to domestic buildings" does not aim to provide a solution - slight movement of houses on foundations is inevitable, as a direct result of seasonal changes in the moisture content of soils. However, the information given will ensure movements associated with shrinkage and swelling are reduced to levels that can be tolerated by the building. 26 pages plus 4-page report form. FB1, foundations, soils, tree roots.